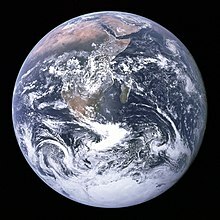 The study of planetary habitability is partly based upon extrapolation from knowledge of the Earth's conditions, as the Earth is the only planet currently known to harbour life. The Gaia hypothesis (/ˈɡaɪ.ə/, /ˈɡeɪ.ə/, /ˈɡaɪˈʌ/), also known as the Gaia theory or the Gaia principle, proposes that living organisms interact with their inorganic surroundings on Earth to form a synergistic and self-regulating, complex system that helps to maintain and perpetuate the conditions for life on the planet. The Gaia hypothesis was initially criticized for being teleological and against the principles of natural selection, but later refinements aligned the Gaia hypothesis with ideas from fields such as Earth system science, biogeochemistry and systems ecology. Lovelock also once described the "geophysiology" of the Earth. [further explanation needed] Even so, the Gaia hypothesis continues to attract criticism, and today some scientists consider it to be only weakly supported by, or at odds with, the available evidence. A reduced version of the hypothesis has been called "influential Gaia" in "Directed Evolution of the Biosphere: Biogeochemical Selection or Gaia?" by Andrei G. Lapenis, which states the biota influence certain aspects of the abiotic world, e.g. temperature and atmosphere. This is not the work of an individual but a collective of Russian scientific research that was combined into this peer reviewed publication. It states the coevolution of life and the environment through “micro-forces” and biogeochemical processes. An example is how the activity of photosynthetic bacteria during Precambrian times have completely modified the Earth atmosphere to turn it aerobic, and as such supporting evolution of life (in particular eukaryotic life). The Gaia hypothesis was an influence on the deep ecology movement. The Gaia hypothesis posits that the Earth is a self-regulating complex system involving the biosphere, the atmosphere, the hydrospheres and the pedosphere, tightly coupled as an evolving system. The hypothesis contends that this system as a whole, called Gaia, seeks a physical and chemical environment optimal for contemporary life. Gaia evolves through a cybernetic feedback system operated unconsciously by the biota, leading to broad stabilization of the conditions of habitability in a full homeostasis. Many processes in the Earth's surface essential for the conditions of life depend on the interaction of living forms, especially microorganisms, with inorganic elements. These processes establish a global control system that regulates Earth's surface temperature, atmosphere composition and ocean salinity, powered by the global thermodynamic disequilibrium state of the Earth system. The existence of a planetary homeostasis influenced by living forms had been observed previously in the field of biogeochemistry, and it is being investigated also in other fields like Earth system science. The originality of the Gaia hypothesis relies on the assessment that such homeostatic balance is actively pursued with the goal of keeping the optimal conditions for life, even when terrestrial or external events menace them. Since life started on Earth, the energy provided by the Sun has increased by 25% to 30%; however, the surface temperature of the planet has remained within the levels of habitability, reaching quite regular low and high margins. Lovelock has also hypothesised that methanogens produced elevated levels of methane in the early atmosphere, giving a view similar to that found in petrochemical smog, similar in some respects to the atmosphere on Titan. This, he suggests tended to screen out ultraviolet until the formation of the ozone screen, maintaining a degree of homeostasis. However, the Snowball Earth research has suggested that "oxygen shocks" and reduced methane levels led, during the Huronian, Sturtian and Marinoan/Varanger Ice Ages, to a world that very nearly became a solid "snowball". These epochs are evidence against the ability of the pre Phanerozoic biosphere to fully self-regulate. Processing of the greenhouse gas CO2, explained below, plays a critical role in the maintenance of the Earth temperature within the limits of habitability. The CLAW hypothesis, inspired by the Gaia hypothesis, proposes a feedback loop that operates between ocean ecosystems and the Earth's climate. The hypothesis specifically proposes that particular phytoplankton that produce dimethyl sulfide are responsive to variations in climate forcing, and that these responses lead to a negative feedback loop that acts to stabilise the temperature of the Earth's atmosphere. Currently the increase in human population and the environmental impact of their activities, such as the multiplication of greenhouse gases may cause negative feedbacks in the environment to become positive feedback. Lovelock has stated that this could bring an extremely accelerated global warming, but he has since stated the effects will likely occur more slowly. 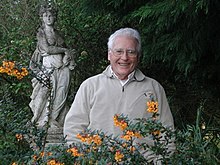 In response to the criticism that the Gaia hypothesis seemingly required unrealistic group selection and cooperation between organisms, James Lovelock and Andrew Watson developed a mathematical model, Daisyworld, in which ecological competition underpinned planetary temperature regulation. Daisyworld examines the energy budget of a planet populated by two different types of plants, black daisies and white daisies, which are assumed to occupy a significant portion of the surface. The colour of the daisies influences the albedo of the planet such that black daisies absorb more light and warm the planet, while white daisies reflect more light and cool the planet. The black daisies are assumed to grow and reproduce best at a lower temperature, while the white daisies are assumed to thrive best at a higher temperature. As the temperature rises closer to the value the white daisies like, the white daisies outreproduce the black daisies, leading to a larger percentage of white surface, and more sunlight is reflected, reducing the heat input and eventually cooling the planet. Conversely, as the temperature falls, the black daisies outreproduce the white daisies, absorbing more sunlight and warming the planet. The temperature will thus converge to the value at which the reproductive rates of the plants are equal. Lovelock and Watson showed that, over a limited range of conditions, this negative feedback due to competition can stabilize the planet's temperature at a value which supports life, if the energy output of the "sun" changes, while a planet without life would show wide temperature swings. The percentage of white and black daisies will continually change to keep the temperature at the value at which the plants' reproductive rates are equal, allowing both life forms to thrive. It has been suggested that the results were predictable because Lovelock and Watson selected examples that produced the responses they desired. Ocean salinity has been constant at about 3.5% for a very long time. Salinity stability in oceanic environments is important as most cells require a rather constant salinity and do not generally tolerate values above 5%. The constant ocean salinity was a long-standing mystery, because no process counterbalancing the salt influx from rivers was known. Recently it was suggested that salinity may also be strongly influenced by seawater circulation through hot basaltic rocks, and emerging as hot water vents on mid-ocean ridges. However, the composition of seawater is far from equilibrium, and it is difficult to explain this fact without the influence of organic processes. One suggested explanation lies in the formation of salt plains throughout Earth's history. It is hypothesized that these are created by bacterial colonies that fix ions and heavy metals during their life processes. In the biogeochemical processes of Earth, sources and sinks are the movement of elements. The composition of salt ions within our oceans and seas is: sodium (Na+), chlorine (Cl−), sulfate (SO42−), magnesium (Mg2+), calcium (Ca2+) and potassium (K+). The elements that comprise salinity do not readily change and are a conservative property of seawater. There are many mechanisms that change salinity from a particulate form to a dissolved form and back. The known sources of sodium i.e. salts are when weathering, erosion, and dissolution of rocks are transported into rivers and deposited into the oceans. The Mediterranean Sea as being Gaia's kidney is found (here) by Kenneth J. Hsue, a correspondence author in 2001. The "desiccation" of the Mediterranean is the evidence of a functioning kidney. Earlier "kidney functions" were performed during the "deposition of the Cretaceous (South Atlantic), Jurassic (Gulf of Mexico), Permo-Triassic (Europe), Devonian (Canada), Cambrian/Precambrian (Gondwana) saline giants." Levels of gases in the atmosphere in 420,000 years of ice core data from Vostok, Antarctica research station. Current period is at the left. The Gaia hypothesis states that the Earth's atmospheric composition is kept at a dynamically steady state by the presence of life. The atmospheric composition provides the conditions that contemporary life has adapted to. All the atmospheric gases other than noble gases present in the atmosphere are either made by organisms or processed by them. The stability of the atmosphere in Earth is not a consequence of chemical equilibrium. Oxygen is a reactive compound, and should eventually combine with gases and minerals of the Earth's atmosphere and crust. Oxygen only began to persist in the atmosphere in small quantities about 50 million years before the start of the Great Oxygenation Event. Since the start of the Cambrian period, atmospheric oxygen concentrations have fluctuated between 15% and 35% of atmospheric volume. Traces of methane (at an amount of 100,000 tonnes produced per year) should not exist, as methane is combustible in an oxygen atmosphere. Dry air in the atmosphere of Earth contains roughly (by volume) 78.09% nitrogen, 20.95% oxygen, 0.93% argon, 0.039% carbon dioxide, and small amounts of other gases including methane. Lovelock originally speculated that concentrations of oxygen above about 25% would increase the frequency of wildfires and conflagration of forests. Recent work on the findings of fire-caused charcoal in Carboniferous and Cretaceous coal measures, in geologic periods when O2 did exceed 25%, has supported Lovelock's contention. Gaia scientists see the participation of living organisms in the carbon cycle as one of the complex processes that maintain conditions suitable for life. The only significant natural source of atmospheric carbon dioxide (CO2) is volcanic activity, while the only significant removal is through the precipitation of carbonate rocks. Carbon precipitation, solution and fixation are influenced by the bacteria and plant roots in soils, where they improve gaseous circulation, or in coral reefs, where calcium carbonate is deposited as a solid on the sea floor. Calcium carbonate is used by living organisms to manufacture carbonaceous tests and shells. Once dead, the living organisms' shells fall to the bottom of the oceans where they generate deposits of chalk and limestone. One of these organisms is Emiliania huxleyi, an abundant coccolithophore algae which also has a role in the formation of clouds. CO2 excess is compensated by an increase of coccolithophoride life, increasing the amount of CO2 locked in the ocean floor. Coccolithophorides increase the cloud cover, hence control the surface temperature, help cool the whole planet and favor precipitations necessary for terrestrial plants. Lately the atmospheric CO2 concentration has increased and there is some evidence that concentrations of ocean algal blooms are also increasing. Lichen and other organisms accelerate the weathering of rocks in the surface, while the decomposition of rocks also happens faster in the soil, thanks to the activity of roots, fungi, bacteria and subterranean animals. The flow of carbon dioxide from the atmosphere to the soil is therefore regulated with the help of living beings. When CO2 levels rise in the atmosphere the temperature increases and plants grow. This growth brings higher consumption of CO2 by the plants, who process it into the soil, removing it from the atmosphere. The idea of the Earth as an integrated whole, a living being, has a long tradition. The mythical Gaia was the primal Greek goddess personifying the Earth, the Greek version of "Mother Nature" (from Ge = Earth, and Aia = PIE grandmother), or the Earth Mother. James Lovelock gave this name to his hypothesis after a suggestion from the novelist William Golding, who was living in the same village as Lovelock at the time (Bowerchalke, Wiltshire, UK). Golding's advice was based on Gea, an alternative spelling for the name of the Greek goddess, which is used as prefix in geology, geophysics and geochemistry. Golding later made reference to Gaia in his Nobel prize acceptance speech. In the eighteenth century, as geology consolidated as a modern science, James Hutton maintained that geological and biological processes are interlinked. Later, the naturalist and explorer Alexander von Humboldt recognized the coevolution of living organisms, climate, and Earth's crust. In the twentieth century, Vladimir Vernadsky formulated a theory of Earth's development that is now one of the foundations of ecology. Vernadsky was a Ukrainian geochemist and was one of the first scientists to recognize that the oxygen, nitrogen, and carbon dioxide in the Earth's atmosphere result from biological processes. During the 1920s he published works arguing that living organisms could reshape the planet as surely as any physical force. Vernadsky was a pioneer of the scientific bases for the environmental sciences. His visionary pronouncements were not widely accepted in the West, and some decades later the Gaia hypothesis received the same type of initial resistance from the scientific community. Also in the turn to the 20th century Aldo Leopold, pioneer in the development of modern environmental ethics and in the movement for wilderness conservation, suggested a living Earth in his biocentric or holistic ethics regarding land. It is at least not impossible to regard the earth's parts—soil, mountains, rivers, atmosphere etc,—as organs or parts of organs of a coordinated whole, each part with its definite function. And if we could see this whole, as a whole, through a great period of time, we might perceive not only organs with coordinated functions, but possibly also that process of consumption as replacement which in biology we call metabolism, or growth. In such case we would have all the visible attributes of a living thing, which we do not realize to be such because it is too big, and its life processes too slow. —  Aldo Leopold, Animate Earth. Another influence for the Gaia hypothesis and the environmental movement in general came as a side effect of the Space Race between the Soviet Union and the United States of America. During the 1960s, the first humans in space could see how the Earth looked as a whole. 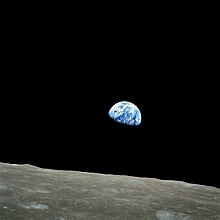 The photograph Earthrise taken by astronaut William Anders in 1968 during the Apollo 8 mission became, through the Overview Effect an early symbol for the global ecology movement. Lovelock started defining the idea of a self-regulating Earth controlled by the community of living organisms in September 1965, while working at the Jet Propulsion Laboratory in California on methods of detecting life on Mars. The first paper to mention it was Planetary Atmospheres: Compositional and other Changes Associated with the Presence of Life, co-authored with C.E. Giffin. A main concept was that life could be detected in a planetary scale by the chemical composition of the atmosphere. According to the data gathered by the Pic du Midi observatory, planets like Mars or Venus had atmospheres in chemical equilibrium. This difference with the Earth atmosphere was considered to be a proof that there was no life in these planets. Lovelock formulated the Gaia Hypothesis in journal articles in 1972 and 1974, followed by a popularizing 1979 book Gaia: A new look at life on Earth. An article in the New Scientist of February 6, 1975, and a popular book length version of the hypothesis, published in 1979 as The Quest for Gaia, began to attract scientific and critical attention. Lovelock called it first the Earth feedback hypothesis, and it was a way to explain the fact that combinations of chemicals including oxygen and methane persist in stable concentrations in the atmosphere of the Earth. Lovelock suggested detecting such combinations in other planets' atmospheres as a relatively reliable and cheap way to detect life. Later, other relationships such as sea creatures producing sulfur and iodine in approximately the same quantities as required by land creatures emerged and helped bolster the hypothesis. In 1971 microbiologist Dr. Lynn Margulis joined Lovelock in the effort of fleshing out the initial hypothesis into scientifically proven concepts, contributing her knowledge about how microbes affect the atmosphere and the different layers in the surface of the planet. The American biologist had also awakened criticism from the scientific community with her theory on the origin of eukaryotic organelles and her contributions to the endosymbiotic theory, nowadays accepted. Margulis dedicated the last of eight chapters in her book, The Symbiotic Planet, to Gaia. However, she objected to the widespread personification of Gaia and stressed that Gaia is "not an organism", but "an emergent property of interaction among organisms". She defined Gaia as "the series of interacting ecosystems that compose a single huge ecosystem at the Earth's surface. Period". The book's most memorable "slogan" was actually quipped by a student of Margulis': "Gaia is just symbiosis as seen from space". James Lovelock called his first proposal the Gaia hypothesis but has also used the term Gaia theory. Lovelock states that the initial formulation was based on observation, but still lacked a scientific explanation. The Gaia hypothesis has since been supported by a number of scientific experiments and provided a number of useful predictions. In fact, wider research proved the original hypothesis wrong, in the sense that it is not life alone but the whole Earth system that does the regulating. In 1985, the first public symposium on the Gaia hypothesis, Is The Earth A Living Organism? was held at University of Massachusetts Amherst, August 1–6. The principal sponsor was the National Audubon Society. Speakers included James Lovelock, George Wald, Mary Catherine Bateson, Lewis Thomas, John Todd, Donald Michael, Christopher Bird, Thomas Berry, David Abram, Michael Cohen, and William Fields. Some 500 people attended. In 1988, climatologist Stephen Schneider organised a conference of the American Geophysical Union. The first Chapman Conference on Gaia, was held in San Diego, California on March 7, 1988. CoEvolutionary Gaia: that life and the environment had evolved in a coupled way. Kirchner claimed that this was already accepted scientifically and was not new. Homeostatic Gaia: that life maintained the stability of the natural environment, and that this stability enabled life to continue to exist. Geophysical Gaia: that the Gaia hypothesis generated interest in geophysical cycles and therefore led to interesting new research in terrestrial geophysical dynamics. Optimising Gaia: that Gaia shaped the planet in a way that made it an optimal environment for life as a whole. Kirchner claimed that this was not testable and therefore was not scientific. Of Homeostatic Gaia, Kirchner recognised two alternatives. "Weak Gaia" asserted that life tends to make the environment stable for the flourishing of all life. "Strong Gaia" according to Kirchner, asserted that life tends to make the environment stable, to enable the flourishing of all life. Strong Gaia, Kirchner claimed, was untestable and therefore not scientific. Lovelock and other Gaia-supporting scientists, however, did attempt to disprove the claim that the hypothesis is not scientific because it is impossible to test it by controlled experiment. For example, against the charge that Gaia was teleological, Lovelock and Andrew Watson offered the Daisyworld Model (and its modifications, above) as evidence against most of these criticisms. Lovelock said that the Daisyworld model "demonstrates that self-regulation of the global environment can emerge from competition amongst types of life altering their local environment in different ways". Lovelock was careful to present a version of the Gaia hypothesis that had no claim that Gaia intentionally or consciously maintained the complex balance in her environment that life needed to survive. It would appear that the claim that Gaia acts "intentionally" was a metaphoric statement in his popular initial book and was not meant to be taken literally. This new statement of the Gaia hypothesis was more acceptable to the scientific community. Most accusations of teleologism ceased, following this conference. By the time of the 2nd Chapman Conference on the Gaia Hypothesis, held at Valencia, Spain, on 23 June 2000, the situation had changed significantly. Rather than a discussion of the Gaian teleological views, or "types" of Gaia hypotheses, the focus was upon the specific mechanisms by which basic short term homeostasis was maintained within a framework of significant evolutionary long term structural change. "How do models of Gaian processes and phenomena relate to reality and how do they help address and understand Gaia? How do results from Daisyworld transfer to the real world? What are the main candidates for "daisies"? Does it matter for Gaia theory whether we find daisies or not? How should we be searching for daisies, and should we intensify the search? How can Gaian mechanisms be investigated using process models or global models of the climate system that include the biota and allow for chemical cycling?" In 1997, Tyler Volk argued that a Gaian system is almost inevitably produced as a result of an evolution towards far-from-equilibrium homeostatic states that maximise entropy production, and Kleidon (2004) agreed stating: "...homeostatic behavior can emerge from a state of MEP associated with the planetary albedo"; "...the resulting behavior of a biotic Earth at a state of MEP may well lead to near-homeostatic behavior of the Earth system on long time scales, as stated by the Gaia hypothesis". Staley (2002) has similarly proposed "...an alternative form of Gaia theory based on more traditional Darwinian principles... In [this] new approach, environmental regulation is a consequence of population dynamics, not Darwinian selection. The role of selection is to favor organisms that are best adapted to prevailing environmental conditions. However, the environment is not a static backdrop for evolution, but is heavily influenced by the presence of living organisms. The resulting co-evolving dynamical process eventually leads to the convergence of equilibrium and optimal conditions". A fourth international conference on the Gaia hypothesis, sponsored by the Northern Virginia Regional Park Authority and others, was held in October 2006 at the Arlington, VA campus of George Mason University. Martin Ogle, Chief Naturalist, for NVRPA, and long-time Gaia hypothesis proponent, organized the event. Lynn Margulis, Distinguished University Professor in the Department of Geosciences, University of Massachusetts-Amherst, and long-time advocate of the Gaia hypothesis, was a keynote speaker. Among many other speakers: Tyler Volk, Co-director of the Program in Earth and Environmental Science at New York University; Dr. Donald Aitken, Principal of Donald Aitken Associates; Dr. Thomas Lovejoy, President of the Heinz Center for Science, Economics and the Environment; Robert Correll, Senior Fellow, Atmospheric Policy Program, American Meteorological Society and noted environmental ethicist, J. Baird Callicott. This conference approached the Gaia hypothesis as both science and metaphor as a means of understanding how we might begin addressing 21st century issues such as climate change and ongoing environmental destruction. After initially being largely ignored by most scientists (from 1969 until 1977), thereafter for a period the initial Gaia hypothesis was criticized by a number of scientists, such as Ford Doolittle, Richard Dawkins and Stephen Jay Gould. Lovelock has said that because his hypothesis is named after a Greek goddess, and championed by many non-scientists, the Gaia hypothesis was interpreted as a neo-Pagan religion. Many scientists in particular also criticised the approach taken in his popular book Gaia, a New Look at Life on Earth for being teleological—a belief that things are purposeful and aimed towards a goal. Responding to this critique in 1990, Lovelock stated, "Nowhere in our writings do we express the idea that planetary self-regulation is purposeful, or involves foresight or planning by the biota". Stephen Jay Gould criticised Gaia as being "a metaphor, not a mechanism." He wanted to know the actual mechanisms by which self-regulating homeostasis was achieved. In his defense of Gaia, David Abram argues that Gould overlooked the fact that "mechanism", itself, is a metaphor — albeit an exceedingly common and often unrecognized metaphor — one which leads us to consider natural and living systems as though they were machines organized and built from outside (rather than as autopoietic or self-organizing phenomena). Mechanical metaphors, according to Abram, lead us to overlook the active or agential quality of living entities, while the organismic metaphorics of the Gaia hypothesis accentuate the active agency of both the biota and the biosphere as a whole. With regard to causality in Gaia, Lovelock argues that no single mechanism is responsible, that the connections between the various known mechanisms may never be known, that this is accepted in other fields of biology and ecology as a matter of course, and that specific hostility is reserved for his own hypothesis for other reasons. Aside from clarifying his language and understanding of what is meant by a life form, Lovelock himself ascribes most of the criticism to a lack of understanding of non-linear mathematics by his critics, and a linearizing form of greedy reductionism in which all events have to be immediately ascribed to specific causes before the fact. He also states that most of his critics are biologists but that his hypothesis includes experiments in fields outside biology, and that some self-regulating phenomena may not be mathematically explainable. Lovelock has suggested that global biological feedback mechanisms could evolve by natural selection, stating that organisms that improve their environment for their survival do better than those that damage their environment. However, in the early 1980s, W. Ford Doolittle and Richard Dawkins separately argued against Gaia. Doolittle argued that nothing in the genome of individual organisms could provide the feedback mechanisms proposed by Lovelock, and therefore the Gaia hypothesis proposed no plausible mechanism and was unscientific. Dawkins meanwhile stated that for organisms to act in concert would require foresight and planning, which is contrary to the current scientific understanding of evolution. Like Doolittle, he also rejected the possibility that feedback loops could stabilize the system. 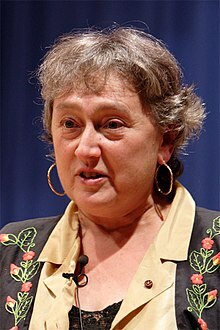 Lynn Margulis, a microbiologist who collaborated with Lovelock in supporting the Gaia hypothesis, argued in 1999, that "Darwin's grand vision was not wrong, only incomplete. In accentuating the direct competition between individuals for resources as the primary selection mechanism, Darwin (and especially his followers) created the impression that the environment was simply a static arena". She wrote that the composition of the Earth's atmosphere, hydrosphere, and lithosphere are regulated around "set points" as in homeostasis, but those set points change with time. The Gaia hypothesis continues to be broadly skeptically received by the scientific community. For instance, arguments both for and against it were laid out in the journal Climatic Change in 2002 and 2003. A significant argument raised against it are the many examples where life has had a detrimental or destabilising effect on the environment rather than acting to regulate it. Several recent books have criticised the Gaia hypothesis, expressing views ranging from "... the Gaia hypothesis lacks unambiguous observational support and has significant theoretical difficulties" to "Suspended uncomfortably between tainted metaphor, fact, and false science, I prefer to leave Gaia firmly in the background" to "The Gaia hypothesis is supported neither by evolutionary theory nor by the empirical evidence of the geological record". The CLAW hypothesis, initially suggested as a potential example of direct Gaian feedback, has subsequently been found to be less credible as understanding of cloud condensation nuclei has improved. In 2009 the Medea hypothesis was proposed: that life has highly detrimental (biocidal) impacts on planetary conditions, in direct opposition to the Gaia hypothesis. In a recent book-length evaluation of the Gaia hypothesis considering modern evidence from across the various relevant disciplines the author, Toby Tyrrell, concluded that: "I believe Gaia is a dead end. Its study has, however, generated many new and thought provoking questions. While rejecting Gaia, we can at the same time appreciate Lovelock's originality and breadth of vision, and recognise that his audacious concept has helped to stimulate many new ideas about the Earth, and to champion a holistic approach to studying it". Elsewhere he presents his conclusion "The Gaia hypothesis is not an accurate picture of how our world works". This statement needs to be understood as referring to the "strong" and "moderate" forms of Gaia—that the biota obeys a principle that works to make Earth optimal (strength 5) or favourable for life (strength 4) or that it works as a homeostatic mechanism (strength 3). The latter is the "weakest" form of Gaia that Lovelock has advocated. Tyrrell rejects it. However, he finds that the two weaker forms of Gaia—Coeveolutionary Gaia and Influential Gaia, which assert that there are close links between the evolution of life and the environment and that biology affects the physical and chemical environment—are both credible, but that it is not useful to use the term "Gaia" in this sense. ^ a b J. E. Lovelock (1972). "Gaia as seen through the atmosphere". Atmospheric Environment. 6 (8): 579–580. Bibcode:1972AtmEn...6..579L. doi:10.1016/0004-6981(72)90076-5. ^ a b Lovelock, J.E. ; Margulis, L. (1974). "Atmospheric homeostasis by and for the biosphere: the Gaia hypothesis". Tellus. Series A. Stockholm: International Meteorological Institute. 26 (1–2): 2–10. Bibcode:1974Tell...26....2L. doi:10.1111/j.2153-3490.1974.tb01946.x. ISSN 1600-0870. Retrieved 20 October 2012. ^ "Wollaston Award Lovelock". Retrieved 19 October 2015. ^ a b Turney, Jon (2003). Lovelock and Gaia: Signs of Life. UK: Icon Books. ISBN 978-1-84046-458-0. ^ Schwartzman, David (2002). Life, Temperature, and the Earth: The Self-Organizing Biosphere. Columbia University Press. ISBN 978-0-231-10213-1. ^ a b Beerling, David (2007). The Emerald Planet: How plants changed Earth's history. Oxford: Oxford University Press. ISBN 978-0-19-280602-4. ^ a b c Lapenis, Andrei G. (2002). "Directed Evolution of the Biosphere: Biogeochemical Selection or Gaia?". The Professional Geographer. 54 (3): 379–391. doi:10.1111/0033-0124.00337 – via [Peer Reviewed Journal]. ^ David Landis Barnhill, Roger S. Gottlieb (eds. ), Deep Ecology and World Religions: New Essays on Sacred Ground, SUNY Press, 2010, p. 32. ^ Owen, T.; Cess, R.D. ; Ramanathan, V. (1979). "Earth: An enhanced carbon dioxide greenhouse to compensate for reduced solar luminosity". Nature. 277 (5698): 640–2. Bibcode:1979Natur.277..640O. doi:10.1038/277640a0. ^ a b Watson, A.J. ; Lovelock, J.E (1983). "Biological homeostasis of the global environment: the parable of Daisyworld". Tellus. 35B (4): 286–9. Bibcode:1983TellB..35..284W. doi:10.1111/j.1600-0889.1983.tb00031.x. ^ Kirchner, James W. (2003). "The Gaia Hypothesis: Conjectures and Refutations". Climatic Change. 58 (1–2): 21–45. doi:10.1023/A:1023494111532. ^ a b c Segar, Douglas (2012). The Introduction to Ocean Sciences. http://www.reefimages.com/oceans/SegarOcean3Chap05.pdf: Library of Congress. pp. Chapter 5 3rd Edition. ISBN 978-0-9857859-0-1. ^ Gorham, Eville (1 January 1991). "Biogeochemistry: its origins and development". Biogeochemistry. Kluwer Academic. 13 (3): 199–239. doi:10.1007/BF00002942. ISSN 1573-515X. ^ http://www.webviva.com, Justino Martinez. Web Viva 2007. "Scientia Marina: List of Issues". scimar.icm.csic.es. Retrieved 2017-02-04. ^ Cicerone, R.J.; Oremland, R.S. (1988). "Biogeochemical aspects of atmospheric methane" (PDF). Global Biogeochemical Cycles. 2 (4): 299–327. Bibcode:1988GBioC...2..299C. doi:10.1029/GB002i004p00299. ^ Karhu, J.A. ; Holland, H.D. (1 October 1996). "Carbon isotopes and the rise of atmospheric oxygen". Geology. 24 (10): 867–870. Bibcode:1996Geo....24..867K. doi:10.1130/0091-7613(1996)024<0867:CIATRO>2.3.CO;2. ^ Harding, Stephan (2006). Animate Earth. Chelsea Green Publishing. p. 65. ISBN 978-1-933392-29-5. ^ "Interagency Report Says Harmful Algal Blooms Increasing". 12 September 2007. Archived from the original on 9 February 2008. ^ a b Capra, Fritjof (1996). The web of life: a new scientific understanding of living systems. Garden City, N.Y: Anchor Books. p. 23. ISBN 978-0-385-47675-1. ^ Lovelock, J.E. (1965). "A physical basis for life detection experiments". Nature. 207 (7): 568–570. Bibcode:1965Natur.207..568L. doi:10.1038/207568a0. PMID 5883628. ^ Lovelock, J.E. ; Giffin, C.E. (1969). "Planetary Atmospheres: Compositional and other changes associated with the presence of Life". Advances in the Astronautical Sciences. 25: 179–193. ISBN 978-0-87703-028-7. ^ Lovelock, John and Sidney Epton, (February 8, 1975). "The quest for Gaia". New Scientist, p. 304. ^ Hamilton, W.D. ; Lenton, T.M. (1998). "Spora and Gaia: how microbes fly with their clouds". Ethology Ecology & Evolution. 10 (1): 1–16. doi:10.1080/08927014.1998.9522867. Archived from the original (PDF) on 2011-07-23. ^ J. E. Lovelock (1990). "Hands up for the Gaia hypothesis". Nature. 344 (6262): 100–2. Bibcode:1990Natur.344..100L. doi:10.1038/344100a0. ^ Volk, Tyler (2003). Gaia's Body: Toward a Physiology of Earth. Cambridge, Massachusetts: MIT Press. ISBN 978-0-262-72042-7. ^ Joseph, Lawrence E. (November 23, 1986). "Britain's Whole Earth Guru". The New York Times Magazine. Retrieved 1 December 2013. ^ Kirchner, James W. (1989). "The Gaia hypothesis: Can it be tested?". Reviews of Geophysics. 27 (2): 223. Bibcode:1989RvGeo..27..223K. doi:10.1029/RG027i002p00223. ^ Lenton, TM; Lovelock, JE (2000). "Daisyworld is Darwinian: Constraints on adaptation are important for planetary self-regulation". Journal of Theoretical Biology. 206 (1): 109–14. doi:10.1006/jtbi.2000.2105. PMID 10968941. ^ Simón, Federico (21 June 2000). "GEOLOGÍA Enfoque multidisciplinar La hipótesis Gaia madura en Valencia con los últimos avances científicos". El País (in Spanish). Retrieved 1 December 2013. ^ American Geophysical Union. "General Information Chapman Conference on the Gaia Hypothesis University of Valencia Valencia, Spain June 19-23, 2000 (Monday through Friday)". AGU Meetings. Retrieved 7 January 2017. ^ Official Site of Arlington County Virginia. "Gaia Theory Conference at George Mason University Law School". Archived from the original on 2013-12-03. Retrieved 1 December 2013. ^ a b Doolittle, W. F. (1981). "Is Nature Really Motherly". The Coevolution Quarterly. Spring: 58–63. ^ a b Dawkins, Richard (1982). The Extended Phenotype: the Long Reach of the Gene. Oxford University Press. ISBN 978-0-19-286088-0. ^ Gould S.J. (June 1997). "Kropotkin was no crackpot". Natural History. 106: 12–21. ^ "The Mechanical and the Organic". Archived from the original on February 23, 2012. Retrieved August 27, 2012. ^ Waltham, David (2014). Lucky Planet: Why Earth is Exceptional – and What that Means for Life in the Universe. Icon Books. ISBN 9781848316560. ^ Cockell, Charles; Corfield, Richard; Dise, Nancy; Edwards, Neil; Harris, Nigel (2008). An Introduction to the Earth-Life System. Cambridge (UK): Cambridge University Press. ISBN 9780521729536. Bondì, Roberto (2006). Blu come un'arancia. Gaia tra mito e scienza. Torino, Utet: Prefazione di Enrico Bellone. ISBN 978-88-02-07259-3. Bondì, Roberto (2007). Solo l'atomo ci può salvare. L'ambientalismo nuclearista di James Lovelock. Torino, Utet: Prefazione di Enrico Bellone. ISBN 978-88-02-07704-8. Jaworski, Helan (1928). Le G��on ou la Terre vivante. Paris: Librairie Gallimard. Kleidon, Axel (2004). "Beyond Gaia: Thermodynamics of Life and Earth system functioning". Climatic Change. 66 (3): 271–319. doi:10.1023/B:CLIM.0000044616.34867.ec. Lovelock, James (1995). The Ages of Gaia: A Biography of Our Living Earth. New York: Norton. ISBN 978-0-393-31239-3. Lovelock, James (2000). Gaia: A New Look at Life on Earth. Oxford: Oxford University Press. ISBN 978-0-19-286218-1. Lovelock, James (2001). Homage to Gaia: The Life of an Independent Scientist. Oxford: Oxford University Press. ISBN 978-0-19-860429-7. Lovelock, James (2007). The Revenge of Gaia: Why the Earth Is Fighting Back — and How We Can Still Save Humanity. Santa Barbara CA: Allen Lane. ISBN 978-0-7139-9914-3. Lovelock, James (2009). The Vanishing Face of Gaia: A Final Warning. New York, NY: Basic Books. ISBN 978-0-465-01549-8. Margulis, Lynn (1998). Symbiotic Planet: A New Look at Evolution. London: Weidenfeld & Nicolson. ISBN 978-0-297-81740-6. Marshall, Alan (2002). The Unity of Nature: Wholeness and Disintegration in Ecology and Science. River Edge, N.J: Imperial College Press. ISBN 978-1-86094-330-0. Staley M (September 2002). "Darwinian selection leads to Gaia". J. Theor. Biol. 218 (1): 35–46. doi:10.1006/jtbi.2002.3059. PMID 12297068. Schneider, Stephen Henry (2004). Scientists debate Gaia: the next century. Cambridge, Massachusetts: MIT Press. ISBN 978-0-262-19498-3. Thomas, Lewis G. (1974). The Lives of a Cell; Notes of a Biology Watcher. New York: Viking Press. ISBN 978-0-670-43442-8. Joseph, Lawrence E. (1990). Gaia: The Growth of an Idea. New York, N.Y.: St. Martin's Press. ISBN 978-0-31-204318-6.